A Trio of Le Peep's New Brunch Cocktails. Photo by Becca Wright. A Houston breakfast staple since the 1980’s, Le Peep’s Galleria spot got a face lift when it opened the doors at a new location this past December, just in time for the new year. It’s now located at 4340 Westheimer in Westheimer Oaks (the center that is also home to Bosscat Kitchen & Libations and Eloise Nichols Grill & Liquors). 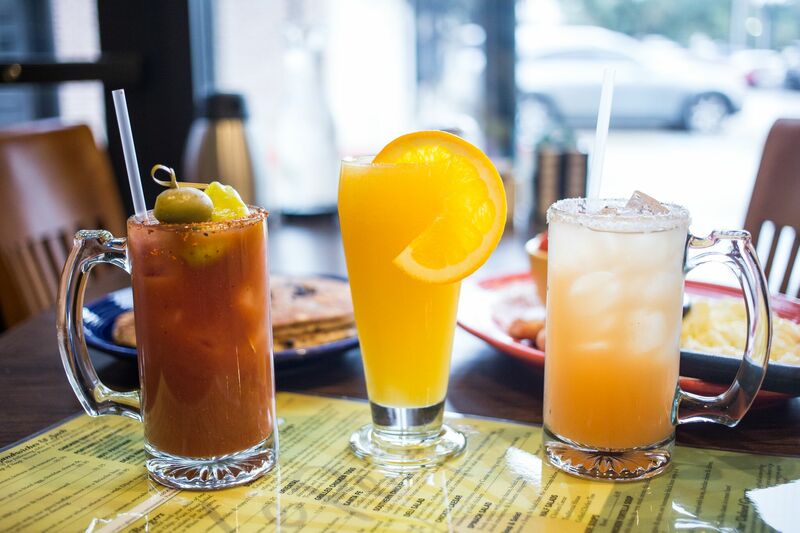 Also new (at both the Galleria and Memorial City locations) are classic brunch cocktails like bloody marys (for those that like it spicy, ask for them to add a “kick”) and mimosas. There are also salty dogs, craft beer and wine. All are served from open to close, seven days a week. Long time lovers of the Galleria Le Peep need not worry as the old school menu favorites and the entire staff of the previous location relocated. Owners Mark Mobley & Brendon Murphy have been well aware of Le Peep’s loyal following over the years. Watching the breakfast and brunch crowd evolve over the years, though, they felt it was time for a location change and a menu upgrade. Coffee à la Le Peep and Katz’s Coffee. Photo by Becca Wright. The new spot is over 4,000 square feet, with a warm tile and wood vibe and a real coffee bar. That’s right, no more waiting in line with cups of coffee anymore, though those are still available by the front door. 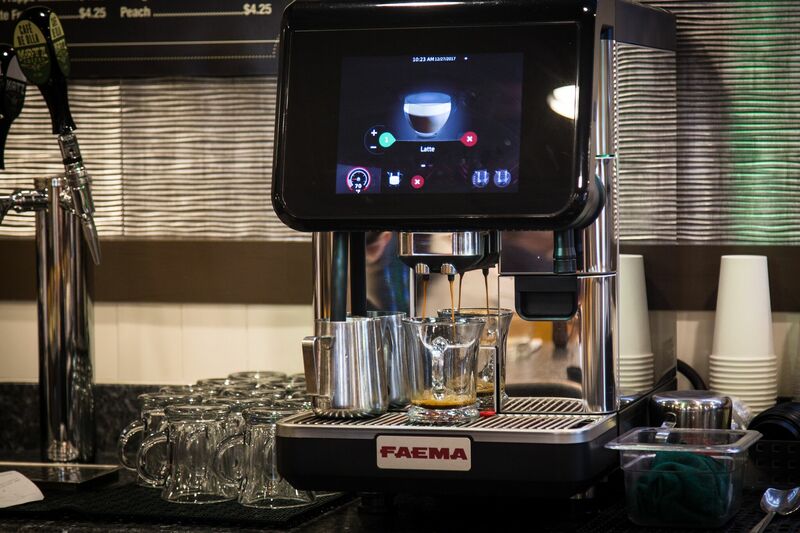 Now, though, diners can hop on a barstool and choose from a selection of Katz’s Coffee, including lattes and cold brew from the tap. While the food menu still features many customer favorites like The Roost (two eggs your way with potatoes, your choice of meats and an English muffin) and The Health Club, featuring six heart- and calorie-friendly options for brunch, some dishes have been taken up a notch. That includes the Fruit Parfait, with freshly baked hunks of granola instead of crumbles and layered with strawberries and bananas. There’s Le Peep’s off-the-menu Churro’ n Bones, combining their signature waffle crusted with cinnamon sugar and a heaping side of “bacon on the bone,” or bone-in cured pork belly. New dishes will be added throughout the year. For those of you who might be worried something you like might not be on the new menu: if you can remember what it’s called or what was is in it, they’ll make it. Breakfast options at Le Peep. Photo by Becca Wright. 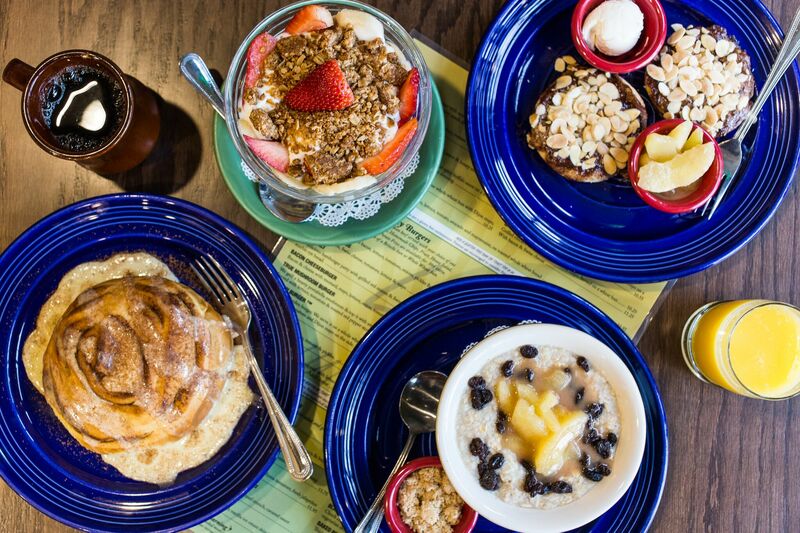 When the weekend comes, Houstonians have no shortage of options for a boozy brunch, but the revitalized Le Peep is a welcome and needed addition for weekdays. Le Peep Galleria, 4340 Westheimer: Open from 6:30 a.m. to 2:30 p.m. Mondays through Fridays and 7:00 a.m. to 3:00 p.m. on weekends. Le Peep Memorial City, 9807 Katy Freeway: Open from 6:30 a.m. to 2:30 p.m. Mondays through Fridays and 7:00 a.m. to 2:30 p.m. on weekends.